Are you looking for office chairs for your employees? If you have a large crew, you are probably thinking about most affordable models. On the other hand, I’m sure that you want to provide your co-workers with ergonomic chairs. Comfort of sitting has huge impact on work efficiency and quality. I prepared this buying guide to show the best ergonomic secretarial chairs that even employer with small budget can afford. 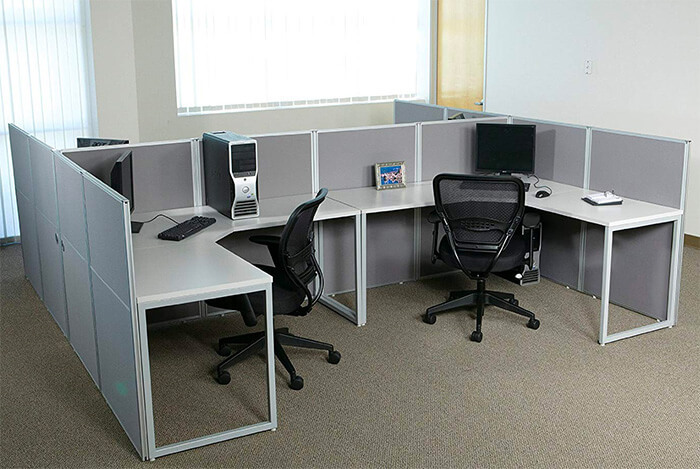 If you want to see more office chairs in wider price range and different styles check our home page. Let’s start with the cheapest secretarial chair in this ranking. Although this model costs less than $50 it still provides good, ergonomic position for long hours of working at the desk. This is a midback chair which means its backrest will probably reach user’s shoulder blades. Therefore there’s no neck support. But thanks to S-shaped backrest this chair fits into user’s spine natural curves. So it is very comfortable even for 8-hour working. 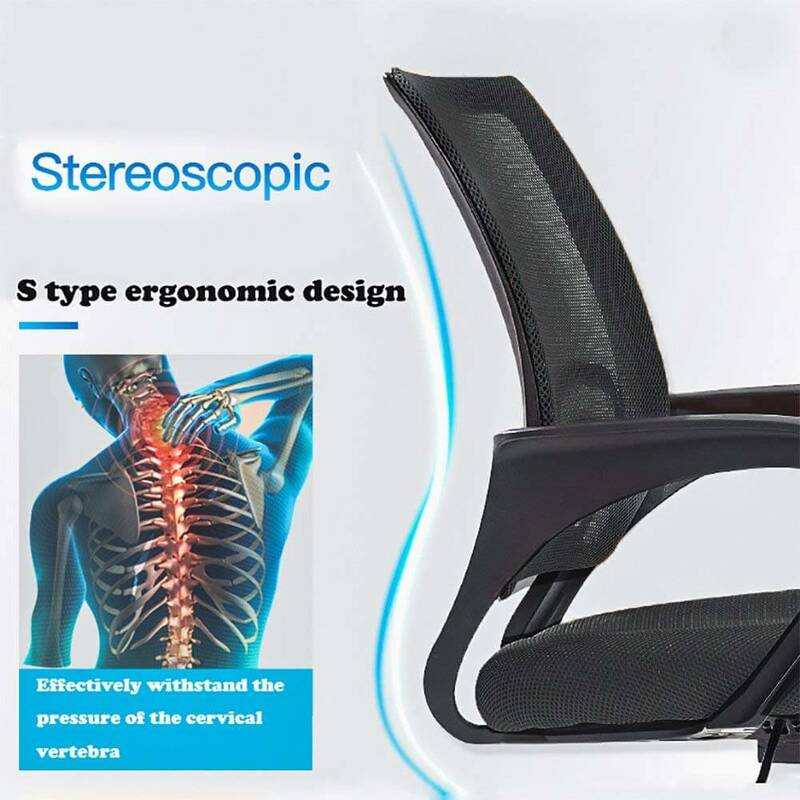 Moreover, the lower part of it is additionally reinforced so it gives good lumbar support. Besides, the back is mesh so it allow for air circulation. No more complains about sweating in your office. 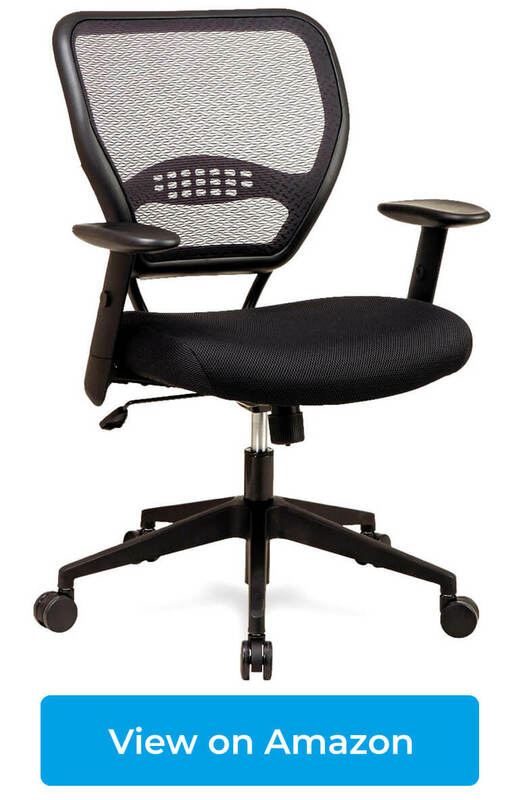 Other features include: adjustable chair height, tilt function with adjustable tension and full 360-degree swivel. This ergonomic secretarial chair is equipped with armrests, unfortunately they are not adjustable. Still, it is a low-budget option, so we can’t expect much! The fact that the chair at this price point has stationary arms is good enough. 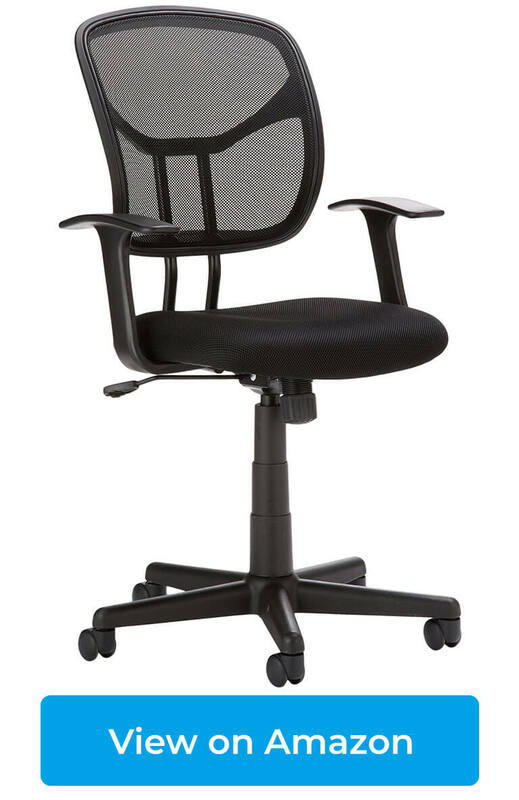 It has capacity of 250 lbs which is rather a standard among cheap office chairs. You are probably wondering if a chair that costs less than $50 is good-quality. According to most of customers on Amazon it is a great, ergonomic chair – budget alternative for more expensive models. Majority of users say it has strong metal base and the whole chair feels stable. Since it doesn’t take up much space it’s perfect for small work space. It moves easily on a wooden floor and carpet. The mesh back works great during hot summer. Customers also say this ergonomic secretarial chair is comfortable and provides average amount of support for lower back. This cheap ergonomic chair is really popular and lots of people buy it for their offices. It’s not bulky and looks quite stylish. It’s also great option for those who need to purchase several pieces because sellers sometimes offer nice deals for bigger purchases. Click here to find out if you can get a discount for ordering several chairs. If you need an ergonomic secretarial chair without armrest or simply have even smaller budget, you may want to check 3PC Black Mesh Office Chair. It has only S-shaped backrest and no arms, so it’s not as ergonomic as other models in this ranking. But it may be a good solution for those who are on a tight budget. This is my proposition of an ergonomic secretarial chair under $100. Just like the previous model it has curved backrest to provide support for lumbar spine. The seat and back are covered with mesh which prevents user from sweating. 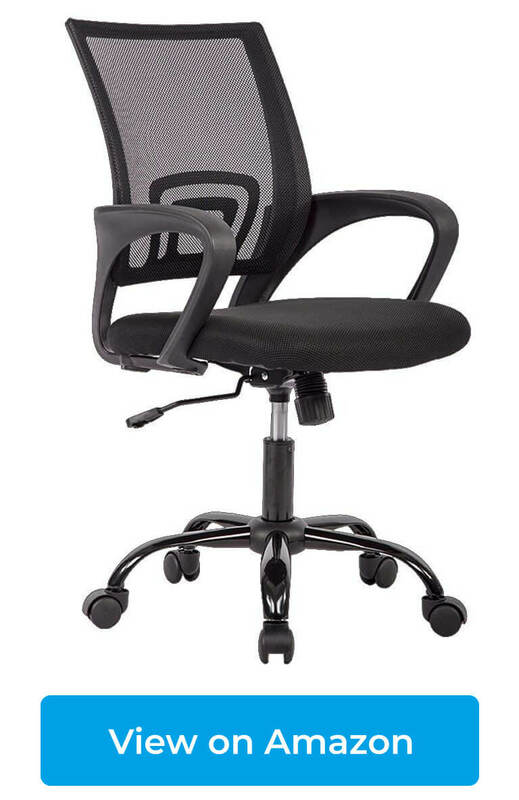 This ergonomic computer chair is height-adjustable and comes with stationary armrests to support your elbows. It has a tilt function as well so you can lean back a bit or lock the chair to prevent it from rocking. You can adjust the tilt tension as well. Dual-wheel casters allow you to roll easily around your office. The capacity of AmazonBasics Mid-back Chair is 225 lbs so it’s definitely not a “big guy chair” but both short and tall people are happy with it (e.g. 5’4’’ and 6’1’’). What I like about this chair is that it’s small, so it fits even in a tiny office space. Besides, it looks simple and elegant. It doesn’t look like a cheap chair at all! No wonder it has hundreds of positive reviews on Amazon. Many users like its medium firmness cushion and good amount of lower back support. Some customer complain about its durability, however majority is satisfied with the compact and quality – especially considering it is a chair under $100. So if you don’t need many features and adjustments and have to stick to your budget, this ergonomic desk chair may be just for you. Here I present you more expensive chair (under $200). But as you will see later, the bigger price is due to some additional features, that previous models lack. This chair from Space Seating has mesh backrest and mesh fabric cover on the seat for improved breathability during long hours of sitting. Lower part of the back is rounded to give user proper lumbar support. Other features of this ergonomic secretarial chair are: adjustable seat height, tilt lock, tilt tension, 360-degree swivel and carpet casters (wheel casters for other types of floor are sold separately). What is great about this chair is that it comes with height-adjustable armrest. So here you can move the arms up and down to adjust them to your elbows and avoid shoulder & wrist fatigue. Awesome and useful feature for those who spend many hours per day on writing and typing and often experience wrist pain. Another thing, that you won’t find on cheaper chairs, is possibility of choosing color of the seat and backrest (Dark, Latte, Shadow) or even the material (mesh or vinyl). Thanks to that you’ll be able to pick a chair that will look perfect in your office space or even let your employees to choose their favorite color version. I also checked customer reviews on Amazon and it turned out dozens of people are very satisfied with this Space Seating chair and praise its durability (it lasts even few years! ), comfort and support. Some customers say it helps to avoid and minimize back problems. Lots of people uses this chair in their home office or business office. One thing few people notice is that this model is not ideal for short person (under 5’5’’). In my opinion this is the best ergonomic secretarial chair in this ranking. Yes it does cost more, but better quality, durability and adjustable armrest always come with bigger price. This chair helps to keep proper posture and supports not only user’s back, but also arms and wrists. And increased comfort leads to better efficiency. You can be sure your workers will be happy with this chair. 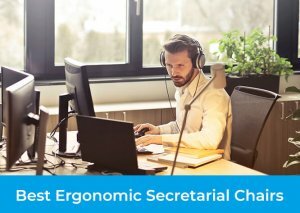 I hope my ranking will help you to choose the best ergonomic secretarial chair and you and your co-workers will be satisfied with it for a long time!